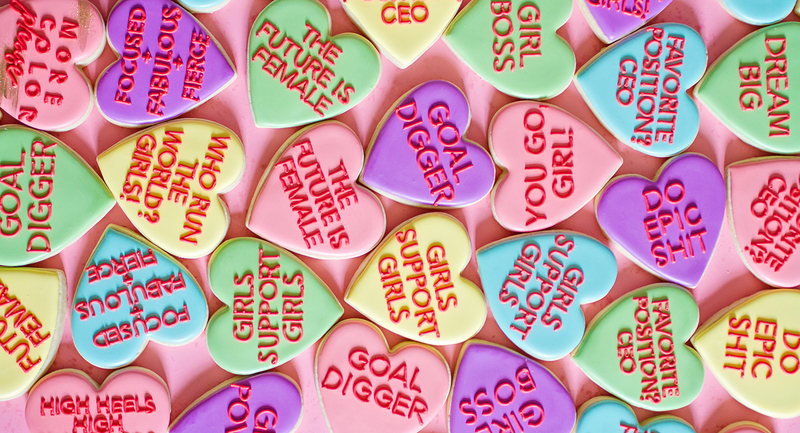 Editor’s Note: By popular demand, we are re publishing these conversation heart cookies in case you need some encouragement today or any day! We are so thrilled you love these as much as we do. 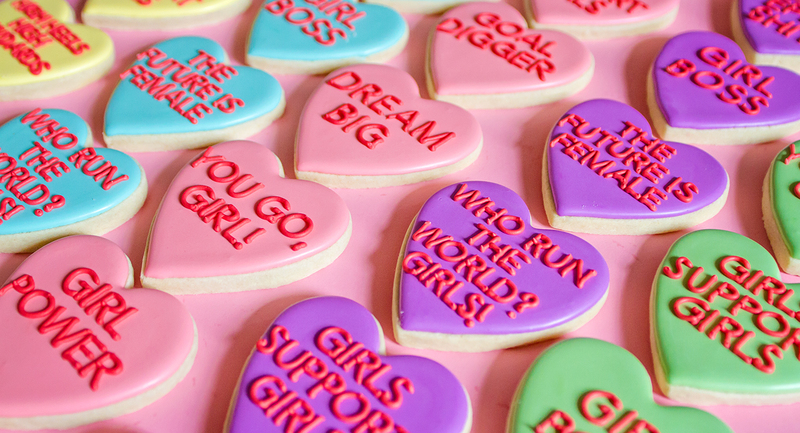 They are inspiring, adorable, and delicious. There’s no better combination! 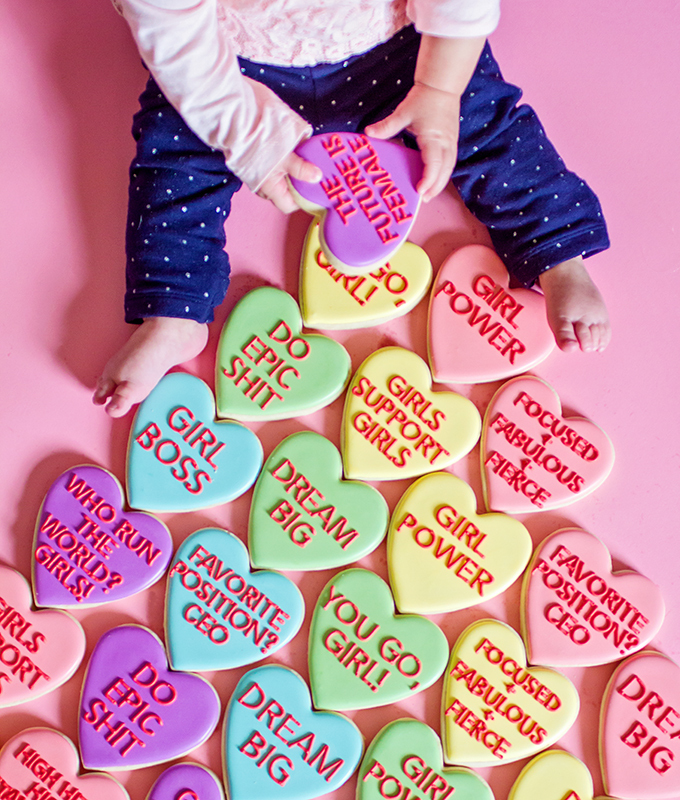 We hope you have a wonderful day today – whether you celebrate Valentine’s Day or not, whether you like the holiday or not – we hope your day is filled with love and surrounded by those who lift you higher. Have a great day! Hi ladies (and gentleman friends) – Carrie here… If you’ve noticed, we’ve gotten into quite the editorial groove this year. In case you haven’t noticed the weekly groove around here, it goes a little something like this… Monday is a personal piece from me, Tuesday is a fashion piece, Wednesday is our words of wisdom feature, Thursday is typically a food feature, and Friday has been host to our wellness series. Well, today’s food feature takes on a bit of a different flavor… It’s not so much a DIY or recipe per se. It’s more so food as inspiration. Is that an idea you can get behind? We sure hope so! 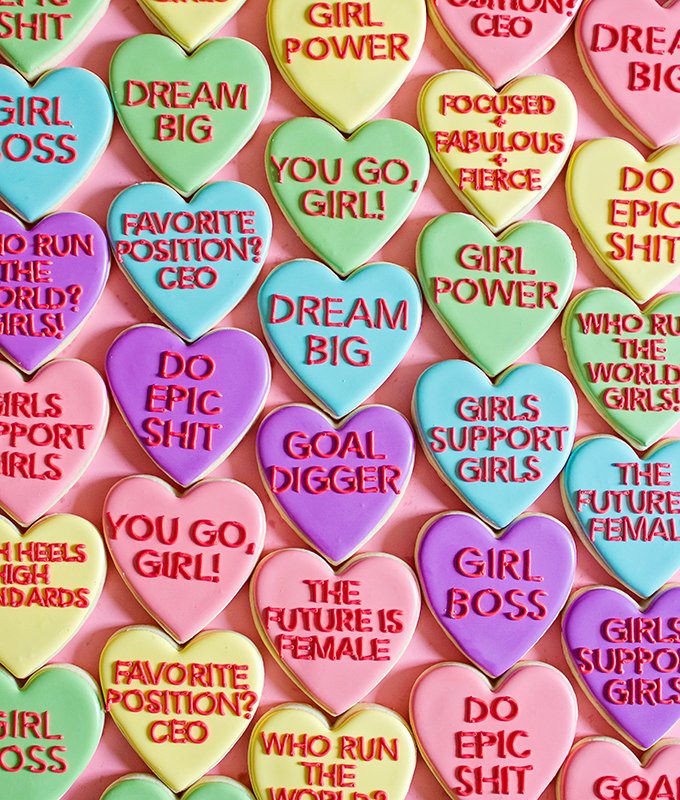 Today, we are taking a cue from traditional Valentine’s conversation heart candies and turning them into something empowering. We have coined them “courage cookies”! It has a nice ring to it don’t you think? After all, we as a team are all about lifting other women up. We believe there is enough room in this world for everyone to succeed, and we are thrilled to watch our friends and colleagues rise up. Each and every day, we hope our site brings you a feeling of empowerment and inspiration and happiness. Indeed, empowering women is part of our mission statement! 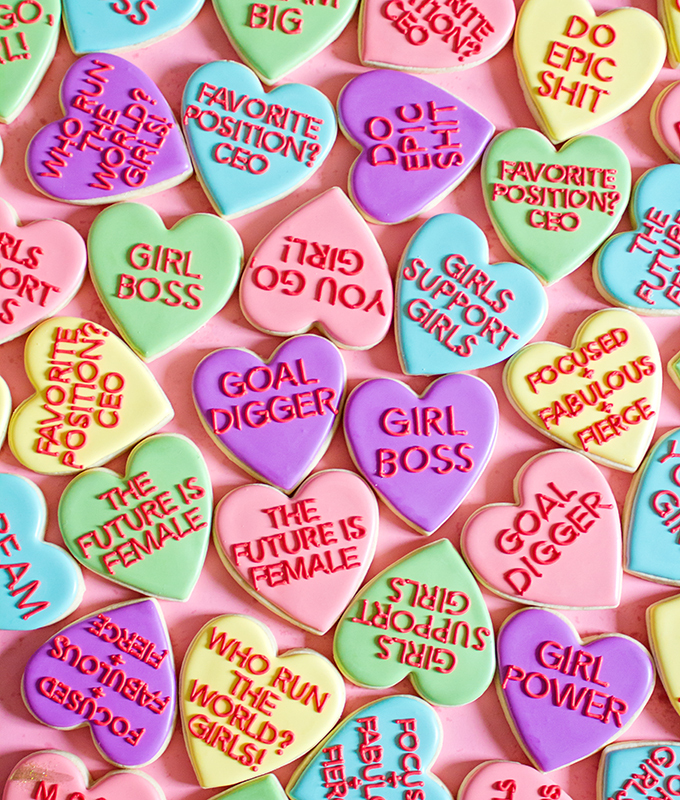 As we mentioned, we’re on the middle of the spectrum when it comes to Valentine’s Day. We aren’t super into the holiday, but we also aren’t totally against it. The way we like to celebrate it is by celebrating the women in our lives and showing them how grateful we are for their friendship and love. We are all about evolving, encouraging, and empowering. And that’s what Valentine’s Day is all about to us. 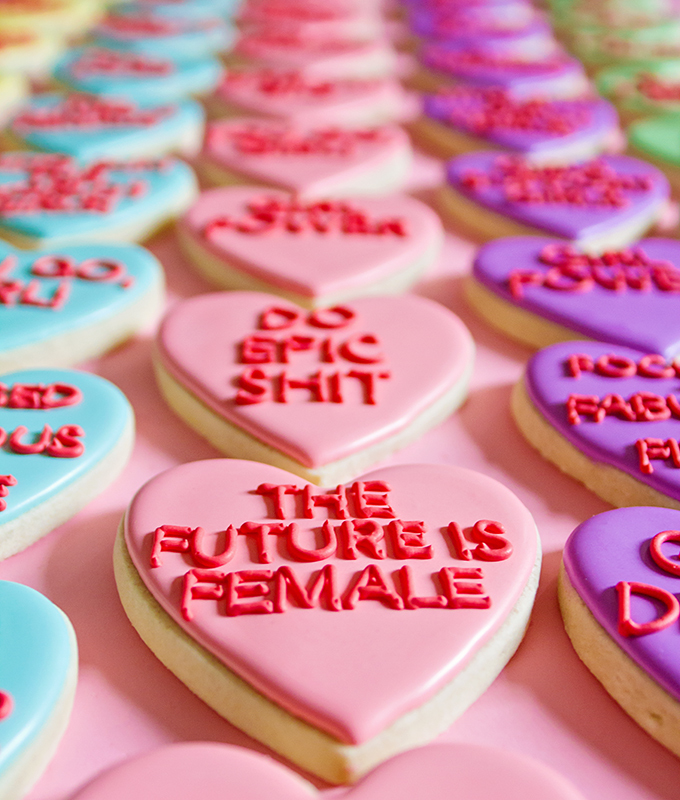 So in addition to our Galentine’s Day brunch, we knew we wanted to do something else for this “holiday of love — something sweet, something inspirational, something empowering, and something sharable. 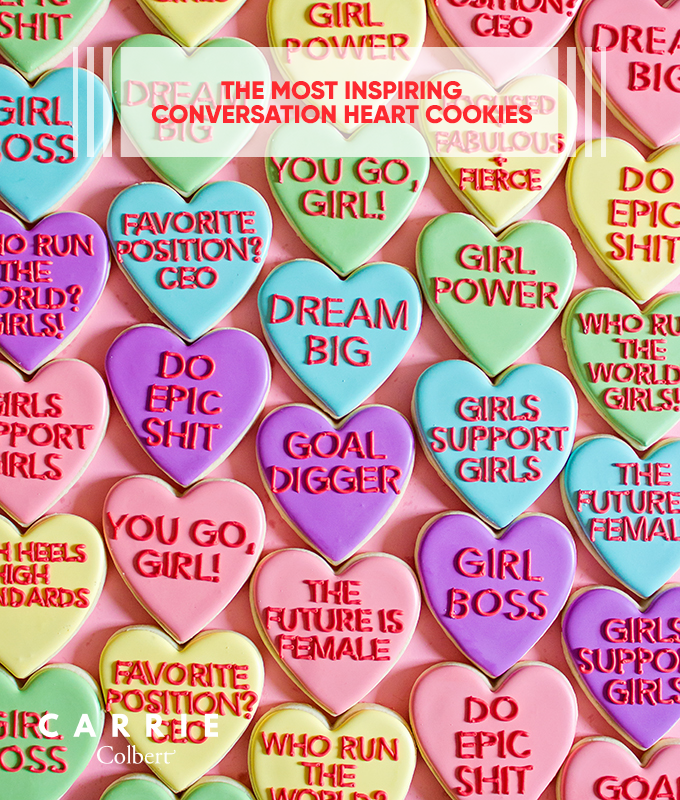 Courage cookies: conversation heart cookies to empower the women in your life! What could be more perfect for this holiday this year? Or really, what could be more perfect any time of year? We could all use some courage and some cookies, right? 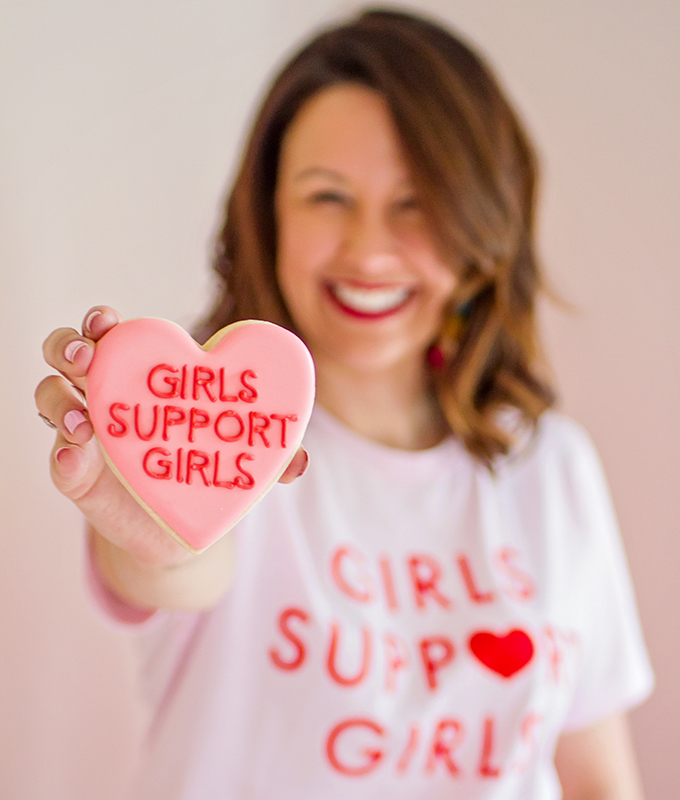 So, we reached out to our friend Shannon Tidwell of Cookies in Color because we knew she would be the one to rock this idea of ours and bring it to life even better than we could have imagined. And she did! 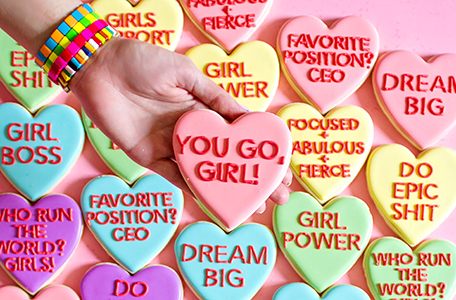 We came up with some of our favorite inspiring sayings and sent them over to Shannon, and the rest is cookie history. 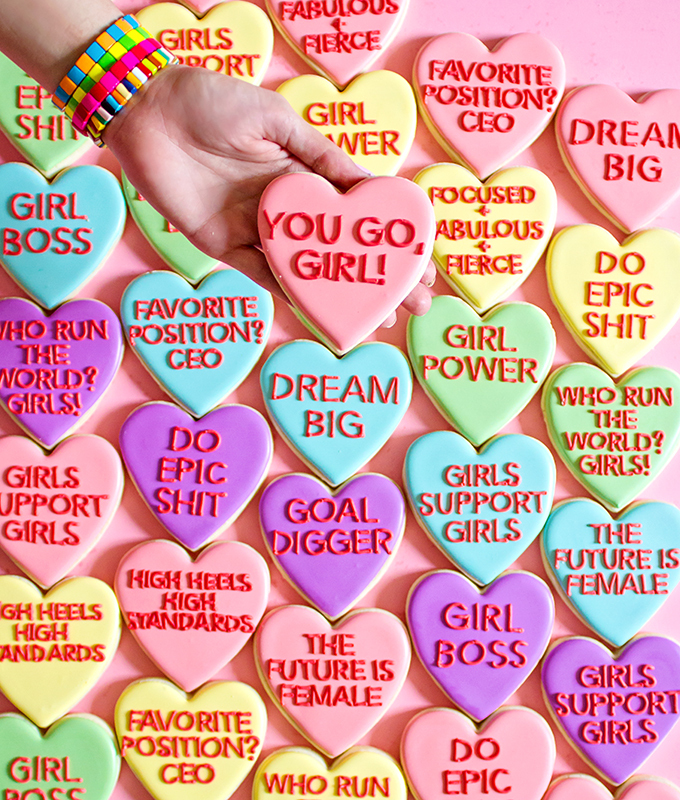 And, thus, we bring you our courage cookies that will hopefully inspire and empower you and all your best gals. 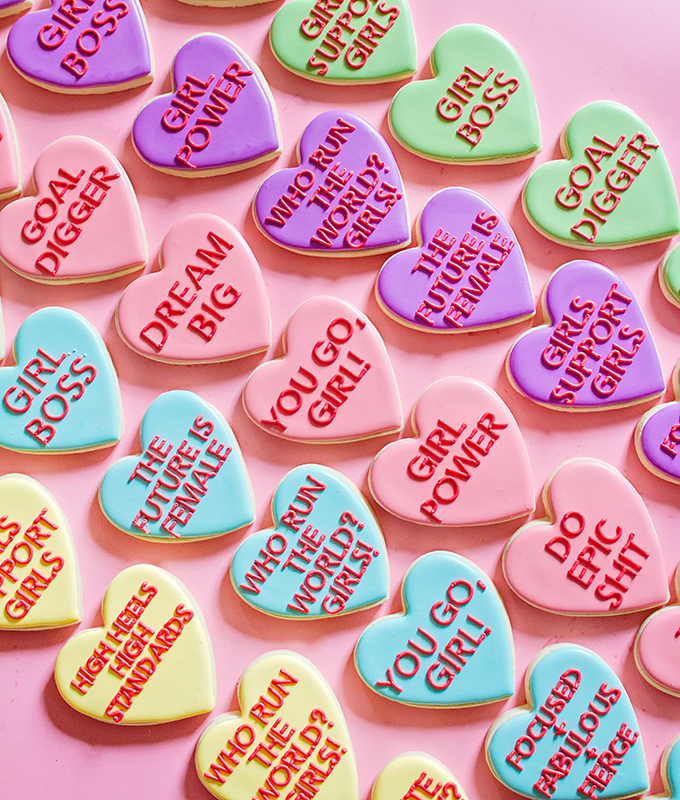 And along with the cookies, we’ve added even more inspirational “girl power” quotes below. If you like what you see, pass it on! Pin it, share it, like it, email it — do whatever you feel would most encourage others in your life today. Spread the sweetness. Convey courage. 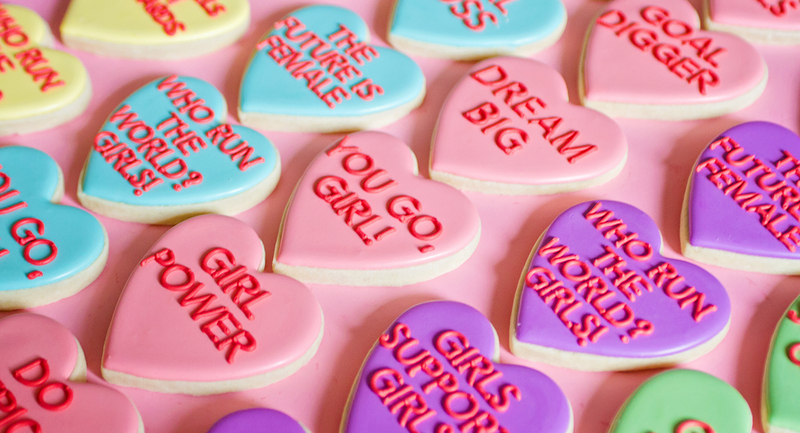 Do you love these cookies as much as we do?! If so, be sure to share with your friends and pin away! A special thanks to Shannon for making our courage cookie dreams come to life (they are beyond delicious, too! ).